Can’t say enough good things about Mathew, Ben & the team from Basement Builders. Phenomenal customer experience from start to finish for our basement renovation. Their entire team – which includes the vendors they work with for finishes – were professional, responsive & respectful of our home and our time. They delivered high quality work for the cost quoted & by the date promised. Mathew & Ben were very transparent and collaborative which engendered a high degree of trust which is worth every penny. Would recommend their services to others in a heartbeat. Basement Builders have been amazing throughout the whole process. Building an entire basement can be quite tedious, but these guys helped us throughout the entire process from designing the layout to customizing every detail. 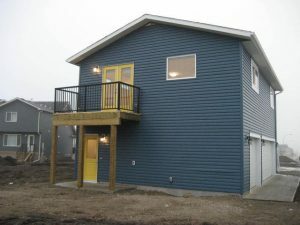 Although there were hiccups along the way, which will inevitably happen in every basement build, Basement builders were quick to respond and resolve the issues. As an added bonus, they upgraded our toilet free of charge! We couldn’t have asked for a better builder. Thanks for the great work! We have been quite enjoying the basement since! Thank you so much Planit Builders for saving the day! I had a contractor in that practically destroyed my basement. Planit builders was able to come in and bring the items (that the last contractor failed epically on) up to code and finish what he had left undone. They were very helpful and knowledgeable and their staff and trades really know their stuff. The quality and professionalism is greatly appreciated. I highly recommend using these guys. We will use The Basement Builders again. The reply card was just too small to give a detailed response, so I have taken the time to write a note. First, we are really very pleased with the results of our basement reno. It matches our house perfectly! which is what we wanted. We were very pleased with the time and patient answers to our question from Mathew and Ben. Both were knowledgeable and very helpful with us. Also, the carpenter Josh did an excellent walk through of the framing and made sure all our desires were included. Ben was always responsive and easy to reach with any problem or concern we had. This was important when we had contractors going in and out on a daily basis. The project did take a little longer than we thought. This was probably due to unforeseen delays, etc. As a Telecommunications Tech myself, I have worked with contractors in the trades before and understand that things come up. All the contractors were good to work with. Two were outstanding and deserve mention: Curtis (Electrician) and Josh (carpenter). They also took time to help us with questions, concerns, etc. The drywallers were also very skilled in their work. We will use The Basement Builders again. Highly Recommend Basement Builders in the Future. We are truly happy with our addition and will highly recommend Basement Builders in the future. I have to write to say how pleased I am with my wet bar and flex rum. It turned out exactly as I wanted. I also want to say what wonderful people you have working for you. These guys are THE BEST! All of the work completed was done to the highest standard, all trades people were professional, tidy, and respectful of our space. From start to finish, the whole process was smooth, painless, and all around awesome (and on schedule!). Honestly, do yourself a favor and just go with the Basement Builders. You will not regret it! My husband and I could not be happier with the level of professionalism, quality of work and great communication that both Mathew & Ben exuded along with the trades men and women that entered our home. Great customer service and a friendly and caring attitude both go a long way. Mathew and Ben truly wanted to ensure we were happy and did everything they could to give us the basement we wanted, and they were successful. Everything ran smoothly. Everything turned out beautifully. We would highly recommend Basement Builders to ANY of our friends and family and if we need further work in the future we will definitely be contacting them. You will not be disappointed! Matt and Ben were great to deal with and made sure we were completely happy with the job. Would highly recommend them.